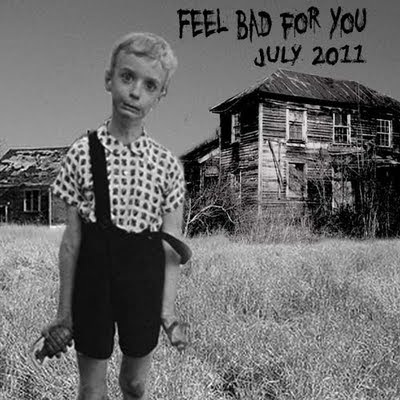 Your monthly comp from bloggers, twitterers, altcountrytab.ca forum members, geeks, weirdos, and musical miscreants. Download or stream below. 1. The Everybodyfields - T.V.A. Comments: To me, this song is almost perfect. Great lyrics about a real historical event from the area I grew up in (I’m sure my relatives would have taken this view), great harmonies and picking, and it really sets a mood. Comments: Buffalo Killers, guitarist and vocalist Andrew Gabbard, bass guitarist and vocalist Zachary Gabbard and drummer Joseph Sebaali. The band was formed in Cincinnati, Ohio, in 2006. Comments: A fantastic, original take on a Robert Pollard classic. Comments: The Gadjits started out as ska-punk proteges of Tim Armstrong (Rancid) but by their third album developed a more pop/rootsy rock sound. This song reminds me of what its like being in your early to mid teens when you fall for someone for the dumbest reasons. It could be called Ex Girlfriend or Ex whatever and you’d still know what he’s talking about. Comments: local(ish) artist I just found out about. Comments: Inspired by Italian film soundtracks. Comments: I have a friend who believes Mick Collins is the perfect man. I’m not about to argue. Comments: I can’t believe the year is half-over. Recognizing that reality, I’m submitting the title track from Rich Hopkins’ 2001 release. Hopkins was the iconic guitarist for Tucson’s The Sidewinders (later known as The Sand Rubies). His guitar talents continue on this release. With vocals from Billy Sedlmayer, the combined sound is a more subdued, polished, even versatile sound than when Hopkins was with The Sidewinders/Sand Rubies. Yes, I submitted a track by The Sidewinders last month. Yes, I got good feedback. Yes, the song title fits this month. No, I won’t apologize for going back-to-back on Hopkins-related music. Comments: He’s best known for his hit "It Never Rains In Southern California" but I’m really liking this track. Comments: Favourite track from my favourite Wrinkle Neck Mules album, apparently a new album's due end of the year – looking forward to that. Comments: So I’ve totally submitted this song to this mixer group before. I don’t care, it’s my favorite song ever…I know a lot of folks who feel this way too…This list includes some of my favorite music snob friends and some members of some of my favorite bands. Comments: Always a sucker for a slowed down jam with a bit of country twang. Kill County has been an out of nowhere kick in the teeth for me and I can’t get enough of this album (what should have been a top 10 of 2010 if I had only heard them earlier). This is what I consider real country music and its frickin’ great. Comments: Possibly my favorite song I’ve heard this year. Hoping it appears on their new album coming out this month. Comments: I’ve been on a bit of jazz bender recently, so I thought I’d toss something a bit different into the FBFY mix this month. Comments: I’m making a mistake I’ve gotta make, and then I’m glory bound. Comments: original and best version of this song. prohibition. This is an up-and-coming alt country band from Toronto. I saw them open for the Drive-By Truckers about a year and a half ago.